“I saw a Rohmer film once. It was kind of like watching paint dry”. So says Gene Hackman, as private investigator Harry Moseby, in Arthur Penn’s Night Moves (1975). It’s a wisecrack, a blow-off line straight from the noir tradition that the film draws from so liberally. The meaning is clear – Rohmer’s films are all about conversations and exchanges that are of no interest to Moseby; full of longueurs that lead nowhere. In short, Rohmer films are static, verbose, boring. But what was it that the late Andrew Sarris noted about Rohmer’s 1969 Ma Nuit chez Maud (the film Moseby has been invited to)? : there’s nothing more cinematic than the spectacle of a man and a woman staying up all night talking. Jacob Leigh, in his impressive and detailed survey of Rohmer, reminds us of Rohmer’s innate ability to infuse his films with an intimate humanism: stories that are at once comic, acerbic, warm, and frigid. Like Ozu and Rossellini before him, Rohmer “filmed stories about human relationships in contemporary society” (xi). Giving us clear insights into how Rohmer’s films came about and what he intended them to be, Leigh – who has already published widely on the director and his films – shows how Rohmer took complete control over all his films, acting as his own producer throughout his career, and writing the scripts. 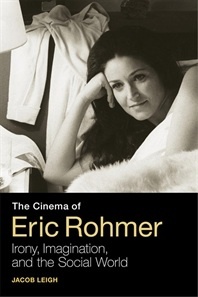 The Cinema of Eric Rohmer combines history and criticism, and offers in-depth analysis of the themes and ideas in each of Rohmer’s twenty-three films, illustrating the complexity of their cinematic style and their non-stop engagement with reality, providing a timely rebuttal to Harry Moseby. There is no overarching thesis here, rather a detailed exploration of Rohmer’s visual sense and narrative techniques. The rationale is provided in the first paragraph: it “focuses on one film at a time, analysing styles and themes, looking at patterns, motifs, settings and viewpoint” (ix). In the ensuing eight chapters, Leigh sensitively charts Rohmer’s early film-making career (there is nothing on Rohmer’s film criticism, his work at Cahiers, or his book with Chabrol on Hitchcock, but plenty on his Schools Television work that saw a sketching out of themes and ideas that would be amplified in the future), his mainstream successes, and his final films, L’Anglaise et le duc (2001), Triple Agent (2004), and Les Amours d’Astrée et de Céladon (2007) via close film analysis. It’s not quite a chronological tour through the highways and byways of Rohmer’s work – Chapter 3, ‘Two period films’, pays close attention to La Marquise d’O… (1976) and Perceval le Gallois (1978), works that are deliberately arch, theatrical, and non-naturalistic that stand outside of Rohmer’s usual forensic exploration of contemporary French mores. Yet the metaphysical concerns of these two ‘historical’ films (one an adaptation of Heinrich von Kleist’s 1808 novel, the other a version of Chretien de Troyes’ Perceval, le Conte du Graal) bleed imperceptibly into the director’s ‘Modern Tales’: the shifting narrative modes, emotional distanciation, erudite dialogue, and ironic detachment in the diptych underscore the thematic consistency in Rohmer’s work. There’s also a welcome diversion into the mid-90s with L’Arbre, le maire et la médiathèque (1993) and Les Rendez-vous de Paris (1995), two short films that permitted Rohmer to take a break from the formal rigour of his weightier work to experiment with breezier narrative techniques.
. Throughout Rohmer’s career, there was always a fascination with stories about one man and two women, a fascination that was endlessly refined into a genre Leigh terms “ironic comedy” (ix). Leigh shows throughout that this label can be applied to virtually every work in the ‘contes’ and ‘comédies et proverbes’. Leigh is also well-versed in the historical backgrounds of the films: he notes that Ma Nuit chez Maud is a “vividly microscopic examination of attitudes and values in 1968 France” (33) and that L’Amour, l’après-midi (1972) was filmed during a period when the French women’s movement began to campaign for women’s rights. Such references are not shoe-horned into the discussions of the films to justify a particular attitude or character motivation; rather, they provide a very specific set of socio-historical circumstances against which Rohmer’s films evolve. These are films, like many set in France in the post-68 era, sensitive to seismic, off-stage shifts. The sophistication of Leigh’s analysis can be seen in his section on Pauline à la plage (1983). Over four pages, he demonstrates how the symmetry of the interactions of the film’s major characters are mapped onto the use of framing and camera shots – the extensive use of windows, doors, and the splitting of images via horizontal and vertical lines is underpinned by bold uses of colour and accentuated lines. Such geometric contours, and the way they can shape multiple points of view (what Rohmer calls “a system of narration”), emphasize the movements of characters within the frame and “represent the observer as voyeuristic spectator” (112). Leigh uses a similar kind of analysis in his discussion of colour in L’Amie de mon amie (1987), again to good effect. Leigh draws our attention to the importance of collaboration in Rohmer’s working methods. He posits him as an auteur in the book’s preamble, but there is also a clear appreciation of other technicians (cinematographers and actors, in particular). One of the most impressive aspects of the book is the depth, clarity, and incisiveness of the Notes section (which runs to nearly eighty pages) and the Bibliography (a further thirty). There is enough in these parts alone to make the book worthwhile, such as the extra information about the choice of a shot or an edit, paratextual data, interviews with actors, and signposts to other films or analysis. There are only a few minor quibbles – the choice of screen grabs could have been better: there might have been more (to break up the text, or draw out attention to a particular point), and often the images are too small to do justice to the kind of spatial sensitivity in Rohmer’s work Leigh writes so persuasively about. Typos are also off-putting: A bout de soufflé is perhaps the most glaring. It might also have been useful to have elaborated on Rohmer’s use of computer-generated imagery and digital composites on L‘Anglaise et le duc: for a director who placed so much stock in the exactitude of time and place, and who was constantly exploring the tensions – both ideological and formal – in literary adaptations, a closer look at the disjunction between historical past and digital present (or a comparison between this film and Pitof’s Vidocq , a similar play on digital surfaces) may have proved fruitful. I’m not sure either I would agree that the conclusion of L’Amour, l’après-midi is “pessimistic and gloomy [and] cheerless” (61) – I always took the tears that flow from Hélène as a sign of the reaffirmation of her marriage with Frédéric. The description too of Rohmer’s debut film, Le Signe du Lion (1959-1962), as “leaden” (5) is also problematic: this is a wonderful ethnographic slice-of-life piece about Paris’s Left Bank, complete with a final vertical pan up the Church of Église de Saint-Germain-des-Prés that surely deserved reappraisal. Still, this is a major achievement from one of the leading Rohmer scholars. As the last few paragraphs make clear, cinema has lost a major voice in Rohmer: his “optimism, hope and faith in humanity” (254) are rare commodities these days. Leigh reminds us throughout that the films left behind are full of a delightful tension: there are strong undercurrents of romanticism aching to break through the surface of these elegant, erudite films. David Thomson, The New Biographical Dictionary of Film, 4th edition (Little, Brown: London, 2002), p. 753.